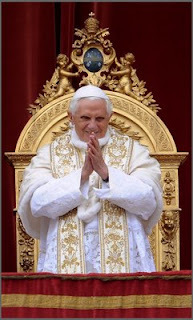 Today is the 82nd birth anniversary of Pope Benedict XVI. Born Joseph Alois Ratzinger on April 16, 1927, in Bavaria, Germany. His father was a policeman, and his mother was the daughter of artisans from Rimsting. Joseph was born on a Holy Saturday and was baptized the same day during the Easter Vigil. In 1939 he entered minor seminary in Traunstein. Life in the seminary at that time was not that easy, especially because of the harsh treatment they all received during the Nazi regime. Although he was opposed to the Nazis, he and the others were forced to join the German anti-aircraft troops. Soon after the war ended in 1945, he reentered the seminary along with his brother Georg, finally being ordained priests on the Solemnity of Saints Peter and Paul – June 29, 1951. Two years after his ordination, Joseph earned his doctorate in theology at the University of Munich. He began teaching theology at the University of Bonn in 1959 with his inaugural lecture, “The God of Faith and the God of Philosophy.’’ This teaching stint paved the way for his distinguished career as professor of theology in several theological schools in Germany. He became widely known as a theologian in and out of his country. During the Second Vatican Council, at the age of 35, he was appointed chief theological advisor of Cardinal Joseph Frings, then Archbishop of Cologne. Pope Paul VI appointed him Archbishop of Munich and Freising on March 25, 1977. He was made cardinal on June 27, 1977. Pope John Paul II designated Cardinal Ratzinger in 1981 as the Prefect of the Congregation for the Doctrine of the Faith, President of the Pontifical Commission, and President of the International Theological Commission. He was elected Supreme Pontiff of the Catholic Church on April 19, 2005. We pray for Pope Benedict XVI on his 82nd Birth Anniversary. We thank the Lord for giving him to us as father, teacher, and guide on our journey of Faith. Provided with a strong example of Christian Charity and devotion, working together as fellow Christians we must fulfill our mission of proclaiming faith, hope, and love with sincere devotion and with utmost self-giving.